This table runner exceeded my expectations. It is very well made! Looks great with my farmhouse decor without being overly trendy. A good transition piece for any season!! This ruffled table runner adds a touch of textured beauty to your dining room tabletop. 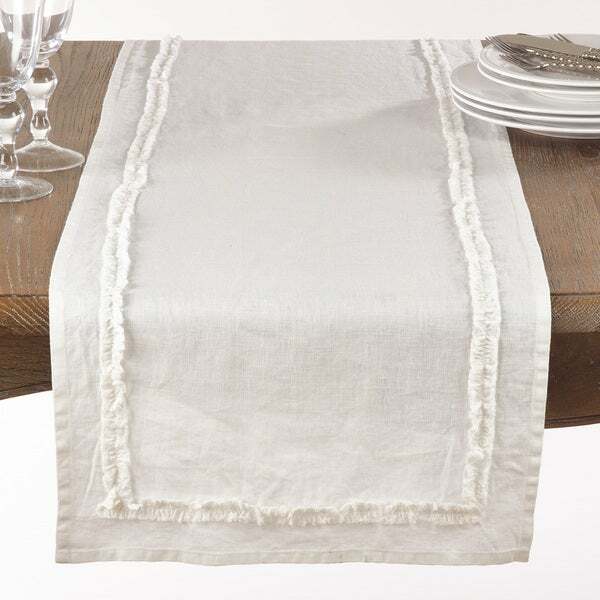 Woven with durable linen and great for everyday entertaining, the table runner gives classic table linens an updated look. I get a lot of compliments on this runner, which I have on my farm table. On top of being pretty, it also washes well. A guest recently spilled gravy on it in several spots. I sprayed the areas with Zout and laundered it a day later, and you can’t even tell! Pretty and practical — a great combination! Nice table runner. Looks great and is holding up nice. Looks great on my table and is made of quality materials. Shipped extremely fast and arrived in a timely manner. Highly recommend. It is a beautiful design and I love the fabric, however, the table runner has some slight discoloration (looks like dirt or dust but doesn't wipe off) around the ruffle on each end. I really like this runner. I had to steam it before use of course, as you can expect linen can get wrinkles like crazy. But it looks great and softens the room up too! Super cute, very shabby chic! I live in Florida so linen can be used all year long. I used this for Thanksgiving this year and it was perfect. It is beautiful & the color is perfect! Excellent quality as always! True to color! Item is very pretty. I am pleased with this purchase.